Architecture students talk straight about what they are (and are not) learning…. Last Saturday, this legendary night owl arose at 4:30am, hung out with a bunch of coffee addicts at Sydney Airport T2, took a 6.15am flight to Melbourne and upon arrival then drove for 2 hours. All in the good name of research. Why? Well, I was kindly offered the opportunity to conduct a focus group with SONA student representatives from most universities across Australia, to specifically discuss the topic of construction education. And what did they say?…. Read on. Firstly, it wasn’t all doom and gloom, and not quite a collective head kicking of the nation’s architecture schools. There were in fact some very positive comments about how construction knowledge is being disseminated, explored, explained, modeled, drawn, discussed and demonstrated. It was also encouraging to know that there are a variety ways in which this core knowledge area is being taught and addressed in the design studio. On the basis of this research project, the pursuit of this topic promises to be a rewarding endeavor, in meeting with teaching staff and looking at how curricula have been developed and reviewed to the benefit of students and their future learning as architects. Having said this, there is an awful lot of room for improvement based on the responses this focus group elicited. What was most striking was that whilst the lines of questioning were mostly focused on learning experiences directly related to commercial construction, materiality and structures, in providing answers the students often found it impossible not to stray into discussing other areas of architectural learning. On the basis of what I have read and researched thus far, these responses were very telling, because they demonstrated that many architecture students quickly gain a basic understanding of the integrative nature of architectural practice, regardless of how they are being taught. What is of more concern, based on the feedback received, is that soon after they come to this understanding, students rapidly conclude that they aren’t receiving adequate direction or teaching to support the development of integrative design practices. Key to this is the manner in which technical subjects are taught (or ignored). From my experiences as a practice director, employer and educator, and again on the basis of my research to date, I cannot say that it is entirely the responsibility of universities to prepare students for architectural practice. Frankly, I think this is impossible: it is called the “practice of architecture” for a reason – that in practicing, you are doing. Universities cannot provide the total practice experience, therefore it is not logical to expect universities to completely prepare architecture students for their future lives as practicing architects. But if there is no formal documentation of the “in house” teaching that practices claim to be doing, isn’t the inverse evidence enough? That students are turning up to work in practices across the nation, wishing they knew a whole lot more? Each Friday we’re going to try and do a quick interior design blog post from our projects, because we believe that experiencing architecture is about the small details as much as the big ideas and urban interventions. 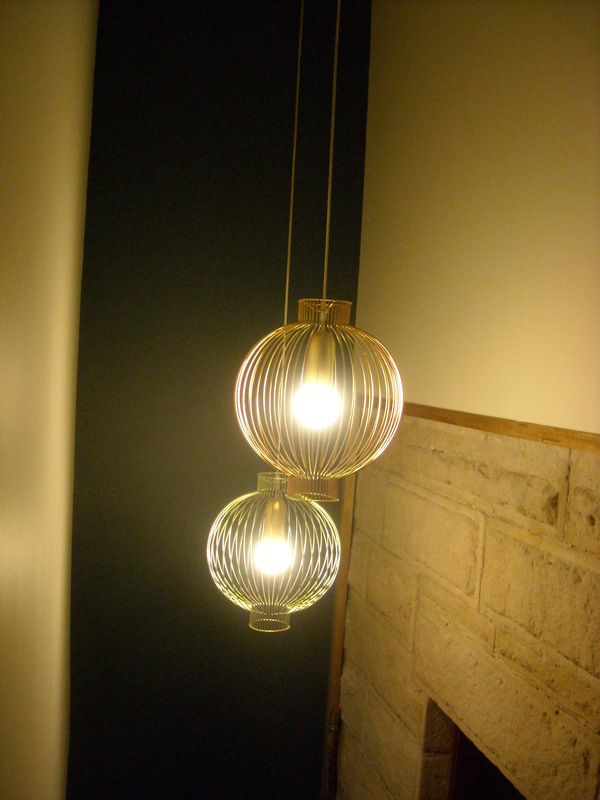 This week we have a couple of happy snaps from a project of ours recently completed in Cammeray. The existing house is a heritage listed sandstone block dwelling with a 10-15 year old split level steel framed addition on the rear. Our brief was to renovate the kitchen/laundry, insert a new ensuite and robe into the roof space adjacent to the upper level bedroom, and undertake interior renovations to the living spaces and stair. There was a lot of fun to be had with this project, including the custom screenprinted translucent blind (digital image and all) and funky new lights from Ism objects. Of course, the end result was also due to our fabulous client who was willing to listen to lots of different and sometimes crazy ideas! After an epic journey from Beijing comprising of three subways, an aeroplane and a crazy taxi, I arrived at Shangai railway station to discover all the trains to Suzhou were full until 9:30pm – it was then 3 in the afternoon. After six hours sitting in the grubby ‘soft seat’ waiting room with a suitcase and a pack of Mentos for company, being stared at (that’ll be the blonde hair), the train finally came, and it turned out I was taking a sleeper car for the 45 minute journey. I settled on my berth and exchanged a polite smile with the man opposite me. We both opened books, and the train pulled out. Just then, an overweight middle aged man wandered past our door. He was not wearing a shirt. Shortly afterwards another man walked past, this time without pants. He proceeded to parade back and forth past the door, much to the general hilarity of the cabin next door. I exchanged a bemused look with the man opposite, and he said something to me, but my complete lack of Mandarin left us unable to communicate. He smiled and closed the cabin door. When we arrived at Suzhou, it turned out my cabin-mate was getting off too. We walked along the platform silently, and he pointed out the way to the taxi rank, fending off the illegal taxi drivers trying to nab the naïve foreigner. As I finally got in a taxi, he waved goodbye. That was my experience of China – it’s dirty, inefficient and then there’s the horror of squat toilets, but it is also unexpectedly quirky and rather charming, not to mention brimming with cultural gems. I was there to study Chinese gardens for a course run by UNSW every summer. We were visiting and photographing gardens around Suzhou and Shanghai, studying the intricate detail of garden design that has lasted hundreds of years. Chinese gardens are highly architectural, with screen walls a pivotal element in guiding the movement of people and energy. Walls, pavilions and rockeries are designed to create or limit views, drawing wanderers along edges and towards nodes. The interplay between rocks and water entices varying reflections, creating beautiful, complex and finely detailed gardens. One of the things that struck me most about the gardens was the relationship between colour and texture and how it impacted on the visitor’s experience. 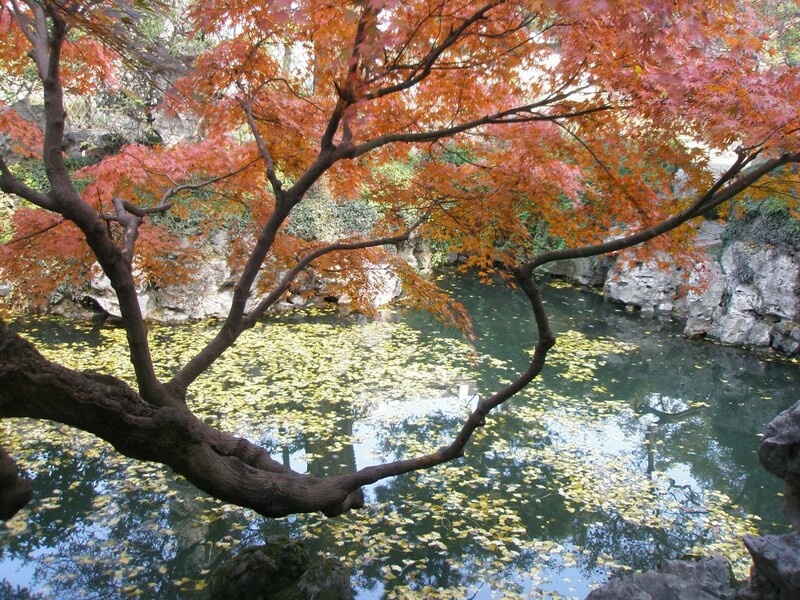 In the Garden of Harmony, a vibrant red tree which reflected in the koi pond was complimented by the fan shaped leaves of bright yellow almond trees, while in the Master of Nets Garden, a pink-leafed tree set against a canvas of whitewashed wall and mosaic pebbles encouraged visitors to move in and look closer. We were encouraged to observe architectural relationships and hierarchies in the gardens, the subtleties of which have remained consistent for centuries, even while the planting has changed over the years. But the gardens were really only half of the experience. Hours spent in the print shop miming and pointing, sipping tea and red bean soup at a traditional tea house, and belting out Whitney Houston ballads at a palatial karaoke complex with the great group of students (and one of our tutors) all helped us to experience and understand modern China and gain a real appreciation for a culture so different to our own. Despite the pollution, crazy rickshaw drivers and chicken’s feet for breakfast, China was a thoroughly unforgettable experience – educational at every level. Welcome To Australian Resource Focus! Our company was started in 2008, and we have been in the market ever since. We have served over 9000+ customers and all of them are happy! This blog is the official blog of our company, and our goal is to educate people!